Home of Acadian-Cajun & French-Canadian Family Surnames & Resources, Family Crests and Historical Information... since 1991. Linking the future to the past........... one name at a time! The 1678 census of Acadia presented in the following eight messages was published in the "French Canadian and Acadian Genealogical Review", Volume VII, No. 1, Spring 1979, pp. 47-66. It was translated into English for publication by Rev. Clarence J. d'Entremont. He has inserted some comments in square brackets [ ] to clarify portions of the census. The original article was profusely footnoted. I have removed all of his notes as to the possible identification of the children in the census, but have left his estimate as to each child's year of birth following their age as it appears in the census, but have left his estimate as to each child's year of birth following their age as it appears in the census. These years did NOT appear in the census. From his comparison to the census of 1671 and 1686, he had determined that this census was possibly taken in the later part of 1678, but more likely in the early part of 1679. A few things, however, need explaining. He notes that LA RAMEE, found on line 3 of folio 17, is actually Charles MELANCON, son of Philippe and Priscilla, and that LA VERDURE on line 6 is his brother, Philippe, Jr. Also, M or /M means months. In folio 17V in the listing for Antoine BOURG & Antoinette LANDRY is shown 1 boy, age 10, who d'Entremont estimates was born in 1660. This is probably just a typographical error, and most likely was their son Antoine born about 1662 according to other censuses. The second family in folio 18, Pierre COMEAUX, is on of only two families in which the children were actually named. The other family was that of Francois GIROUER and Jeanne AUCOIN whose son Germain was named. Curiously, for you science buffs, Pierre was the only one in the census who claimed ownership of a compass. Sounds like he may have had a bad sense of direction <big grin>. In folio 18V in the listing of Estienne COMMAU and Marianne LEFEVRE, the middle child is probably their daughter Catherine. In the listing for Antoine BABIN and Marie MERCIER, 6 girls are mentioned but only 5 ages are listed. In folio 19 in the listing for Rene RIMBAULT and Anne Marie, he comments that Anne Marie must have been an Indian girl. In the next listing, he interprets Onis GODET as Denis GAUDET. In folio 20 in the listing for Marie SALE Widow Jean Claude, he comments: "Marie SALE was living with this family. She was the widow of Jean Claude, who was an Indian. The case of a woman marrying an Indian is very rare; this is the only case we know of in Acadia..." He further states that Marie SALE was probably also the widow in first marriage of Martin AUCOIN, and hence, the mother of Martin AUCOIN, Jr., the first of the name in Acadia. I have tried to proofread the following messages as well as possible. Those which appear to be misspellings, such as LA PRENCE, COLLORON, Geneviefve LE FRAN, BERAUD (BREAU), BERNABE, ROBICHAU and several uncapitalized names, are as they appeared in the article. Of course, I was not able to include any accented characters in names and places, but we're used to that, aren't we? (signed, Lucien Comeau, Gretna, La. 08/24/93, 21:50cdt)... 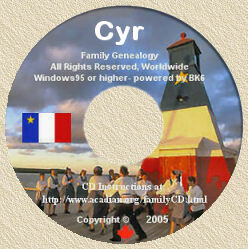 Copied from the "In Search of Our Acadian Roots" CD-ROM, produced by Yvon Cyr in 1994. San SOUCY 29d 1 acre of high land, bordering at one end on the river, at the other end on the North wood [and] on one side Anthoine HEBERT [and] Denis GODET. 6 acres at Port Royal [,] Lyon RAMPA[N]T[,] bordering on Germain then on the meadow and the p[etite] R[ivier] then on Renee LANDRY. I am grateful to Joe Crochet who provided the above-noted information for the... "In Search of Our Acadian Roots" CD-ROM ©1994 (now available in Windows Version). Click on the buttons below, to view Acadian Census of your choice.